When we feature books here on Wednesday, they really are books that David and I read together. But sometimes it's like pulling teeth to read anything that does not involve Toy Story, Wall-E or Cars. It's a little bit of a race at the library. David stuffs books into our bag based on Disney characters or Nickelodeon shows. 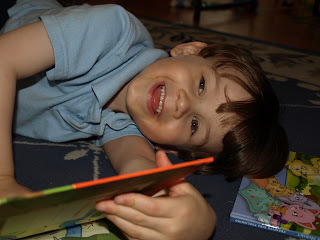 I scramble to find Caldecott and Newbury winners, classic characters like Frog and Toad and Little Bear, and short chapter books that will stretch his little imagination. Parenting is challenging stuff sometimes. But I know that reading to my little guy, whether we are reading JM Barrie's Peter Pan or we are reading Cars for the 23rd time this week, is one of the most important things I can do for him. Even if you are not a momma or a daddy, you can still read to a child. It's really a great experience, promise. So dust off your favorite children's book and go find your niece and nephew or your neighbor or volunteer at your library. Share the book love, my friends. Wednesdays with David: Happy Birthday, Monster! Christmas and books? Yes, please! It's Monday and we're going to Disney World!